Florida is known to have a strong juvenile court system anchored on its vision to provide safe and nurturing communities that provide for all needs, recognize the strengths, and support the success of youth and their families. Through their services, particularly intervention, prevention, and treatment, they truly are on the first line when assisting troubled youth. Prevention and education are essential. Partnerships with judicial, legislative, and community stakeholders are vital in its success in delivery of services. Effective intervention equals public safety for all. Children should be accorded a safe and nurturing environment. Physical development and mental health are important aspects in both prevention and intervention. The Florida Senate recently passed House Bill 411. Florida’s Juvenile Court System 411 bill focuses particularly on student discipline and the duties of relevant stakeholders connected with this. It provides certain guidelines so that schools’ policies in the discipline are in line with those of the juvenile justice system rather than just imposing a black and white zero tolerance approach to petty crimes and minor disturbances in schools. K-12 student and parent’s rights – Parents of public school students must receive timely and accurate information on their children’s behavior and academic performance. Proper monitoring and feedback could aid in assessing the need to intervene in some cases. This particular statute also details the right of students to safety while they are in school. Duties of stakeholders – This statute details the duties of the school board, the principal, the teachers, and other school personnel as they endeavor to uphold student discipline in their respective schools. It provides specific limitations to their authority as well as red flags if they have been profligate or negligent with their duties in ensuring school safety for all. Dropout prevention and academic intervention – There is an established connection between dropping out from school and becoming a juvenile delinquent. This statute remedies the situation by listing possible ways to prevent this from happening through academic programs and other opportunities that would motivate students to stay in school. The policy of zero tolerance – For the past few years, the trend has always been zero tolerance for crimes in schools. This particular statute limits this kind of approach. Crimes and other general disturbances should be referred to the juvenile court system to ensure that the consequences imposed would be both legal and appropriate for the case. It also emphasizes that these referrals must be applied to all students equally regardless of disability, race, or economic status. Policy on bullying and harassment – Schools are required to adopt a policy that protects students and employees from bullying and harassment. In creating and evaluating this policy, all stakeholders must be involved. This includes students, parents, teachers, administrators, school staff, community representatives, and local law enforcement. The policy must be integrated into the school’s curriculum and be at the forefront of violence prevention efforts. 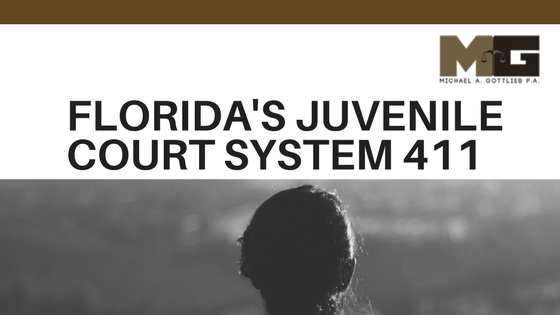 Florida’s Juvenile Court System 411 bill is just an example of how vigorous the juvenile court system of Florida is. By implementing this bill, schools in Florida are empowered to become a place of safety and security for all young people. If you or your kids run afoul of the law, call Michael Gottlieb. He is a personable, seasoned, and intelligent lawyer who will fight for you.